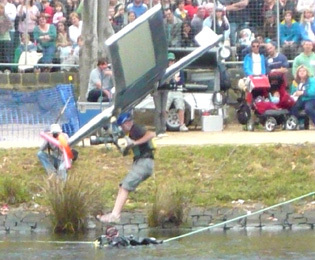 The Moomba Waterfest - or Moomba Festival - is a Melbourne icon. It is a free huge, vibrant family and community festival held around Yarra - over the four days of the long weekend in March. 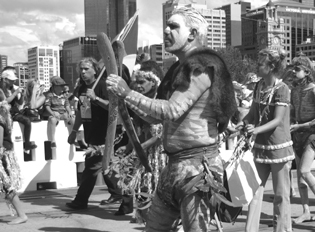 Moomba celebrates Melbournes colourful and harmonious multicultural diversity. It is a wonderful opportunity for a great family day by the banks of the Yarra, and is particularly loved by kids. It is organised by the city of Melbourne. The actual origin of the festival is in the fifty-years-of-Federation celebrations of 1951. This had a parade and theatre production: "An Aboriginal Moomba: Out of the Dark". In the following year, there was a March Labour Day procession. Putting the two together, it was Queen Elizabeth II, who visited Melbourne in 1954, and proposed the Moomba Festival. Floats with an annual theme have always been a key part of the festival. They were from sister cities, schools and community groups - also promoting various aspects of the arts, like singing, dancing, and design. 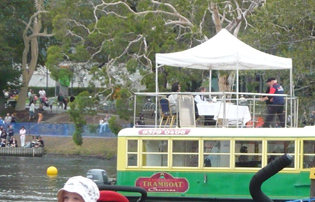 There have also been annual Monarchs of Moomba  one of the most celebrated but also controversial components of the festival over the years. Queens and Kings of Moomba have been beauty queens, actors, an opera singer, a boxing champion, a Russian clown, an indigenous pastor, a ballet dancer, Micky Mouse, as well as various performers and entertainers. The Moomba Waterfest has been a keenly anticipated Melbourne childhood, family and community experience over the years. 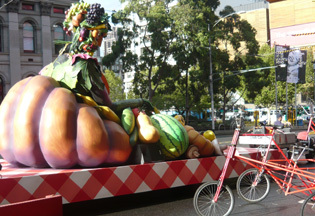 The Moomba Parade is the centre piece of the Moomba Waterfest. It is made up of spectacular floats, dancers, performers, costumed riders, old fashioned bikes, school and ethnic groups in their traditional outfits. It focuses on celebration and cultural diversity. 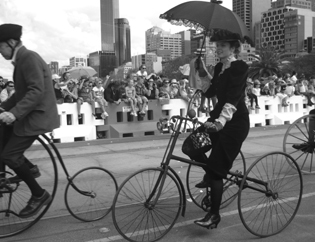 It is a great spectacle in the spirit of Melbourne, vibrant and energetic, and travels through the heart of the city. Its last float is that of the Moomba King and Queen. The parade is on the Monday, starting around 11am. The Birdman Rally has everyday Melburnians in various costumes, contraptions and flying machines attempting to keep themselves airborne. From a four-metre platform they are leaping off and flying as far as possible across the river. Lots of splashes, as the birdmen fly, flap, glide, float  and fall! It is a fun event, with people attached to wings, balloons or any other idea that may float. The platform is docked at Birrarung Marr. The best place to watch is birdmen is from the lawn in front to the rowing sheds on the other side of the Yarra. Its at noon, on the Sunday. The Moomba Masters are world-class Water Ski Championships, showcasing an outstanding and elite field of Australian and International water ski and wakeboard athletes. You can line the Yarra River to watch these astonishing jumps, amazing tricks and sensational slalom runs. Moomba Rhythms, on the main stage in Alexandra Gardens, is presenting an outstanding music program throughout the festival. There are cultural performances in the Cultural Quarter at Birrarung Marr  a fascinating mix of musical genres, from Japanese drumming to Mexican dancers and Afghani rhythms. Moomba Beats is a youth stage, showcasing awesome live music with young performers. There is a silent disco where you can dance to music selected by you on provided headphones. For the kids there are activities and performances at the Childrens Garden, and a tangled web at Art Play at Birrarung Marr. There are skate, scooter and BMX competitions and clinics at Alexandra Gardens. You can swing through the air on a giant trapeze and even take a class where you learn to leap and make the catch. There are colourful carnival rides  flashing lights and spinning wheels  for people of all ages at Birrarung Marr throughout the festival. Across three nights of the Moomb Festival, there are three luminous and breathtaking pyrotechnic displays on the Yarra River at around 9pm. Moomba literally lights up Melbournes sky and providing a fitting end to each memorable Moomba day.